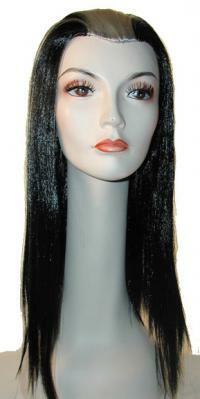 Show off your vibrant style with the Vampira wig that is sleek and smooth with its fine quality material. The thick and full hair gives it volume with a great look for any costume or Halloween party. The white streak that streeks down the center of the wig is an attention grabber and will show off your unique personality. You will have the light and comfortable feeling of a quality made wig that allows you to play as long as you like.